1854-S $2 1/2 VF35 PCGS Secure. Ex: Davis-Graves, Norweb. The present offering of a VF35 PCGS 1854-S quarter eagle ranks among the most memorable lots in this sale; in fact, the 1854-S quarter eagle is among the most memorable U.S. coin issues of all time, regardless of the particular venue. Only 246 examples were produced in the first year of operations at the San Francisco Mint, and it appears that all of them quietly slipped into circulation. Legendary Fort Worth, Texas, coin dealer B. Max Mehl discovered the first reported specimen in 1910 through his "extensive advertising," a piece he apparently sold privately to prominent Wisconsin collector H.O. Granberg. In addition to Granberg, the list of former owners of 1854-S quarter eagles today is a Who's Who of American numismatic luminaries of several generations: Atwater, Clapp, Wolfson, Boyd, Norweb, Eliasberg, Bass. The acquisition of this Choice VF specimen will confer instant numismatic immortality on its possessor. "The San Francisco issue is from 1854 to '79, except '55, '64 and '74. The great prize of the series is 1858. 1876 is scarce, but no other date should be so from the amount coined." Today we know that San Francisco made no quarter eagles in 1858 -- and we wonder what mintage figure he was using for the 1854-S.
As our detailed roster below indicates, somewhere between a dozen and a dozen and a half examples -- no more -- can be traced today. No Uncirculated examples of the 1854-S quarter eagle are known, and any survivor is sure to cause fervent bidding among the many specialists in Western gold. "In addition to the low recorded mintage, the 1854-S has the distinction that in David Akers' survey it was the second rarest quarter eagle in terms of the number of auction appearances over the years, and was tied with the exceedingly rare 1806/5 overdate and the 1841. Only the 1814 variety with 13 reverse stars appeared less frequently." This Choice VF piece is moderately abraded, with three pinscratches appearing behind Liberty's head and more in the reverse fields. The surfaces nonetheless remain quite luminous, with original luster appearing in the obverse margins, which are a lighter yellow than the honey-gold of the rest of the piece. A diffuse sage-colored copper spot occurs at the rim above OF on the reverse. Solid detail contributes to the Choice VF grade, with the details practically those of the Extremely Fine level. We cannot overstate the importance of this monumental offering. 1. AU53 NGC. F.C.C. Boyd (World's Greatest Collection, Numismatic Gallery, 1/1946), lot 242; Memorable Collection (Numismatic Gallery, 3/1948), lot 222; New Netherlands (51st Sale, 6/1958), lot 837; later, Harry W. Bass, Jr. (Bowers and Merena, 10/1999), lot 472; Superior (1/2004), lot 792. Bass' acquisition records indicate he acquired this coin in October 1974 from an unknown source. Past rosters have incorrectly included the Superior Rio Rancho offering (lot 89, just below) here. 2. XF45 PCGS. Rio Rancho Collection (Superior, 10/1974), lot 89; Heritage (2/2007), lot 4325. 3. XF45 NGC. C.L. Lee Family (American Numismatic Rarities, 9/2005), lot 1128. Reportedly held by several generations of the C.L. Lee family since the late 1850s. 4. XF45. Smithsonian Institution. Prior provenance unknown. Illustrated by David Akers in Auction Analysis of Quarter Eagles and in 100 Greatest U.S. 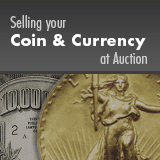 Coins and Encyclopedia of U.S. Gold Coins, both by Jeff Garrett and Ron Guth. 5. VF35 ★ NGC. Auction '86 (Paramount, 7/1986), lot 1867; Chicago Sale (RARCOA, 8/1991), lot 937; Los Angeles Signature Auction (Heritage, 7/2009), lot 1224. 7. VF25 NGC. Belden Roach Collection (B. Max Mehl, 2/1944), lot 1001; Gilhousen Collection (Superior, 2/1973), lot 184; Rio Rancho Collection (Superior, 10/1974), lot 90; Dr. Franklin Altany (Paramount, 2/1977), lot 589; Windsor Collection (Abner Kreisberg Corp., 11/1981), lot 307; Heritage (2/2005), lot 7584. 8. AU Details Scratches, Cleaned NGC. Atwater Collection (B. Max Mehl, 6/1946), lot 2072; Grant Pierce (Stack's, 5/1965), lot 1154; R.L. Miles (Stack's, 10/1968), lot 166; 1973 ANA (Jess Peters, 8/1973), lot 826; 1974 MANA (Kagin's 304th Sale, 11/1974), lot 1547; Fairfield Collection (Bowers and Ruddy, 10/1977), lot 1544; Scott-Kinnear Collection (Sotheby's, 10/1982), lot 13; Heritage (10/1995), lot 5527; Heritage (9/2005), lot 4337; Boston ANA Signature (Heritage, 8/2010), lot 3424; Rarities Night (Stack's Bowers Galleries, 8/2011), lot 7614. Illustrated in Walter Breen's Complete Encyclopedia of U.S. and Colonial Coins. This lot was unplated in the Atwater catalog. However, B. Max Mehl described the coin: "On the upper left obverse field there is a slight indentation or probably a tiny nick." This matches later plates of the piece and no others in the roster. 9. Fine 12 PCGS. Wolfson Collection (Stack's, 10/1962), lot 165; S. Hallock DuPont (Sotheby's, 9/1982), lot 85; Herbert Melnick (11/1983), lot 2762; Stack's (400th Sale, 1/1988), lot 366; Broadus R. Littlejohn, Jr. Collection (Schuyler Rumsey, 2/2012), lot 345; Denis Loring and Donna Levin. 10. Fine 12 NGC. Ezra Cole Collection (Bowers and Merena, 1/1986), lot 2546; Superior (10/1989), lot 4037; Superior (5/1990), lot 5431; Stack's (5/2006), lot 2220; Heritage (7/2008), lot 1902. 11. Very Good. 1979 ANA (New England Rare Coin Auctions, 7/1979), lot 82; Auction '81 (Paramount, 7/1981), lot 1405; Stack's (5/2000), lot 1194. 12. Good 6 PCGS. The discovery specimen. B. Max Mehl; H.O. Granberg; Elmer Sears; John H. Clapp; Louis E. Eliasberg, Sr. (Bowers and Ruddy, 10/1982), lot 170; Stetson Collection (Bowers and Merena, 5/1993), lot 587; Donald E. Bently Collection (Heritage, 3/2014), lot 30266. A. Very Fine. J.F. Bell Collection (Stack's, 12/1944), lot 240. Illustrated in the catalog but unmatched to any above. The catalog description calls the piece "Strictly very fine." The piece illustrated appears XF or even finer by today's standard and is most likely the finest known Bass coin, although an exact match of the plates is impossible. In his Complete Encyclopedia, Walter Breen assigned the Bell coin to both the Boyd-Bass specimen and the Farouk specimen. B. Fine. Abner Kreisberg and Hans M.F. Schulman (2/1960), lot 2592. Described there as, "The obverse is just about Very Fine, Reverse Fine." The piece is illustrated, but the catalog quality renders plate matching impossible. Based on assigned grades, the coin is almost certainly absent among the first few coins listed above. It is also not the Eliasberg coin, as he owned that piece in 1960. We believe the Wolfson coin (number 9 in the roster) is the closest match. C. Very Fine. King Farouk (Sotheby's, 2/1954), lot 278. This was a group lot that offered 15 different quarter eagles, described as "Some very fine." The 15 coins constituted a complete 1853-1856 set of quarter eagles including mintmarked issues. Individual coins were unplated. Breen provided an earlier pedigree for this coin from Waldo Newcomer and Col. E.H.R. Green, but it is unverified today. Breen also claimed this was the J.F. Bell coin and gave it a later pedigree to Gilhousen, et al. (number 7 in our list above). Gaston DiBello's annotated copy of the sale recorded Paul Wittlin as the purchaser of this lot and evaluated Farouk's 1854-S as "funny." D. Very Fine. Menjou Collection (Numismatic Gallery, 6/1950), lot 1326. Unplated. Breen assigned this appearance to the Boyd-Bass finest known specimen. E. AU. Pennsylvania Sale (Kagin's, 2/1947), lot 2449. F. XF. Texas Sale (Kagin's, 12/1951), lot 1693.